Apple has released the second beta versions of iOS 12.1 for iPhone and iPad, along with beta 2 of macOS Mojave 10.14.1 for Mac. Beta releases are available for users enrolled in the respective beta testing programs. iOS 12.1 beta 2 includes many new Emoji icons, while macOS 10.14.1 beta will presumably get the same Emoji icons later. Separately, new betas are available for Apple Watch with watchOS 5.1 beta, and there is a new beta for tvOS 12.1 for Apple TV as well. The new iOS 12.1 beta 2 release includes over 70 new Emoji icons, including character person emojis with orange hair, various new person emojis with various new hair styles, a bagel, peacock, macaw, test tube, a ball of yarn, a lobster, a kangaroo, lettuce, salt shaker, cupcake, a boot, skateboard, lacrosse stick, llama, raccoon, mosquito, compass, swan, frisbee, and more. Emoji icons are very popular for many iPhone and iPad users, so the inclusion of new Emoji icons will likely lead to a rapid adoption of iOS 12.1 once it is finalized. Apple is actively promoting the new Emoji icons coming in iOS 12.1 in a press release on their website here, which is where the following animated GIF originates from as well. Aside from the emoji, no other features of iOS 12.1 are mentioned in the download notes or the press release from Apple, though it’s likely the iOS 12.1 release will include various feature enhancements and bug fixes. For example, apparently the beta release resolves an issue experienced by some users experiencing inconsistent device recharging. iOS 12.1 beta currently includes capabilities for using group FaceTime with up to 32 people in video chat. Users enrolled in the iOS 12.1 beta testing program can find the latest update available now from the Software Update mechanism of the Settings app in iOS. Typically a developer beta build is released first, then a public beta release of the same version appears soon after. 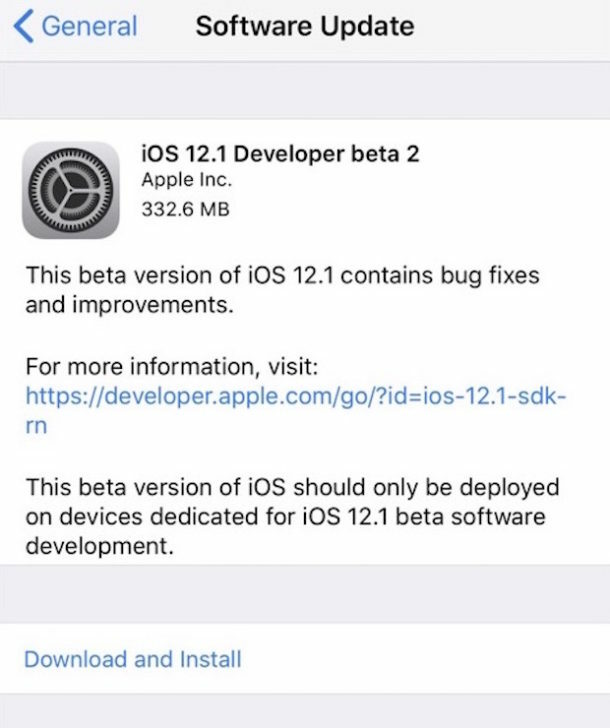 If you were previously enrolled in the iOS 12 beta but then later left the iOS 12 beta program then you’d need to re-enroll and download the beta profile onto an iPhone or iPad to find the iOS 12.1 beta 2 software update available. Likewise, the new macOS 10.14.1 beta 2 release is available for Mac beta testers to download now from the Software Update control panel in Mac OS Mojave, unless you had previously chosen to stop getting beta updates in macOS Mojave. While macOS 10.14.1 beta 2 appears to include support for Group FaceTime, it’s not clear if the 70+ new emoji are included in this beta release yet. Apple states that the new Emoji icons from iOS 12.1 beta 2 will also arrive in future versions of macOS and watchOS, so Mac and Apple Watch Emoji fans shouldn’t feel too left out. Who needs features when you have Emoji?!?! 70 new Emojis, but there are still millions of possibilities! We must have every possible human appearance combination in Emoji! An Emoji for every human ever to exist and ever to exist! In all seriousness, I wish that professional iOS users could disable all of the goofy childish iPhone features like “Stickers” and “Animoji” and “Message Effects” and the like. Just a simple settings toggle to disallow all of that would be great. This stuff is aimed at kids and goofing off, but unprofessional and clutters the experience, it is distracting and while I am sure teenagers enjoy the teenage experience it is not really suited for a professional environment to have sticky Emoji GIF animations plastered into messages. It’d be also nice to get a Bold Fonts feature in macOS Mojave. I find the fonts are too small without enough contrast, making them bold like you can in iOS would make a nice difference. Also I wish there was a darker contrast mode in Dark Mode for macOS Mojave, the gray is a little too soft once you disable transparency and it makes it hard to read. Needs more contrast and bolder fonts too. Well the emojis can certainly be disabled. Just go to settings>general>keyboard and delete the emoji keyboard. No idea, however, if that also eliminates the new animojis, since I don’t have a luxurious iphone X or later device. BTW I noticed a subtle change in imessages not mentioned above. In the past, if you wanted to send a picture from your photo library you had to tap the camera icon to find the option to access your photo library. Now, in iOS 12, the camera icon takes directly to the Camera app, and a new photos app icon has been added in the apps area (the same where apple pay and the stickers are also located) to access the photo library.